These pecan pie bites call for just 4 ingredients but they’re in no way short on flavour. 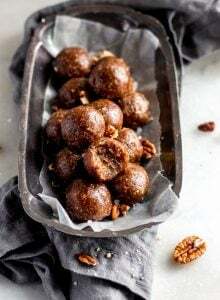 Get your pecan pie-fix in healthy bite form! You can enjoy these for a snack, dessert or as part of a healthy breakfast. Or try them crumbled over banana ice cream, a smoothie bowl or chia seed pudding. Mix until it forms a dough.